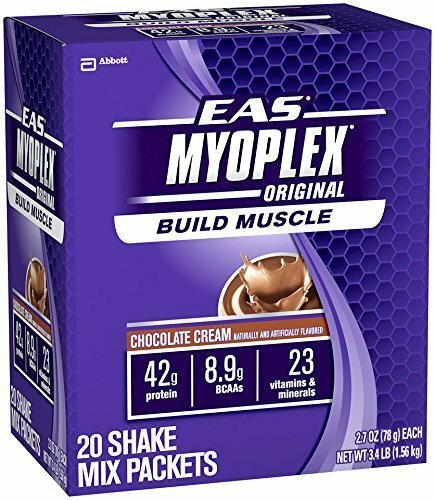 EAS Myoplex Original Protein Shake Mix Packets contain a premium protein blend for building lean muscle. They provide 42g of high-quality protein and 8.9g BCAAs to stimulate muscle protein synthesis so you can recover faster and grow stronger. Our product is NSF tested and certified and available in great-tasting Chocolate Cream, Strawberry Cream, and Vanilla Cream. 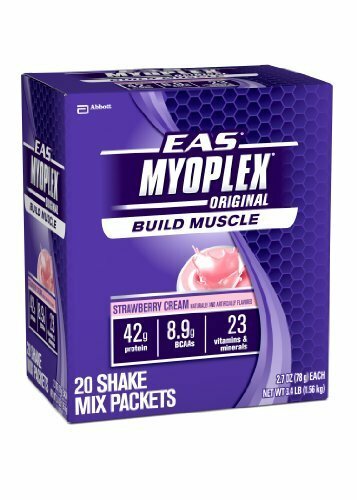 Convenient, single-serve Myoplex Original Protein Shake Mix Packets are an easy way to help maximize muscle gain post workout. 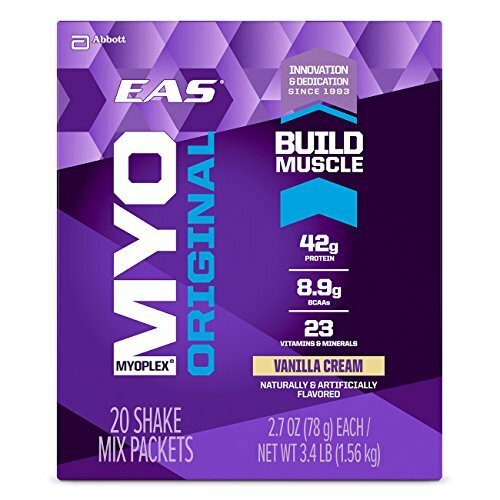 Myoplex Vanilla Cream 20 PacketTaken within 30 minutes post-workout, the 42g of high-quality protein in Myoplex Original helps you refuel, build lean muscle, and maintain an active lifestyle. Added nutritional support helps improve overall body composition.Directions Take within 30 minutes post-workout to support muscle recovery, or use anytime as a quick/easy meal replacement to keep energy levels up.Supplement FactsServing Size: 78 g PacketAmount Per Serving% Daily Value***Calories290Calories from Fat40Fat4.5 g7%Saturated Fat1.5 g8%Cholesterol50 mg17%Sodium270 mg11%Potassium550 mg16%Carbohydrate22 g7%Dietary Fiber3 g12%Sugars2 gProtein42 g84%Vitamin A50%Vitamin C40%Vitamin E100%Thiamin40%Riboflavin50%Niacin45%Vitamin B645%Folate50%Vitamin B1260%Biotin50%Pantothenic Acid50%Calcium60%Iron40%Phosphorus45%Iodine50%Magnesium45%Zinc50%Selenium45%Copper45%Manganese80%Chromium80%Molybdenum90%Chloride10%***Percent Daily Values are based on a 2,000 calorie dietWarnings: Keep out of reach of children. As with all dietary supplements, consult your healthcare professional before use. See product label for more information. 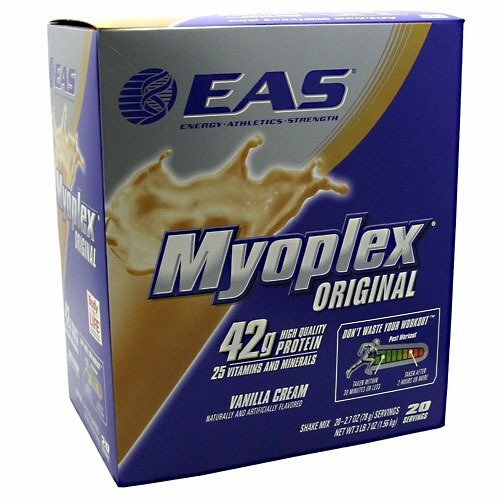 EAS Myoplex Lite Nutrition Shake Vanilla Cream Description: 33% Fewer Calories than Myoplex Original 26 Vitamins and Minerals 24 g Protein Myoplex Lite is a unique precision-nutrition shake designed specifically for individuals who wish to reduce caloric intake or who are interested in weight management and fat loss. 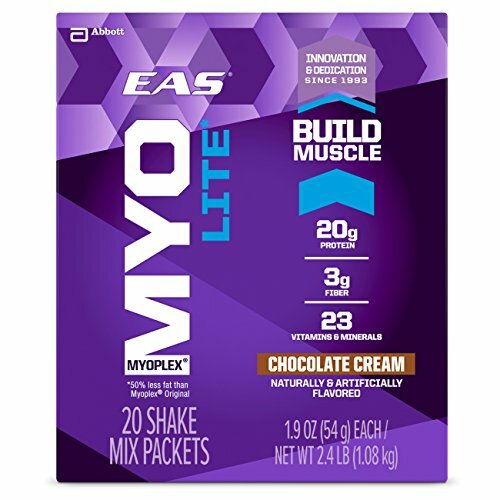 Myoplex Lite is formulated to include protein, vitamins, minerals and other essential nutrients your body need to maintain muscle tissue, with fewer calories to optimize fat burning while supporting metabolic rate. Each convenient and delicious serving provides 25 grams of high quality protein and 20 grams of energy sustaining carbohydrates with only 180 calories and 1.5 grams of fat. 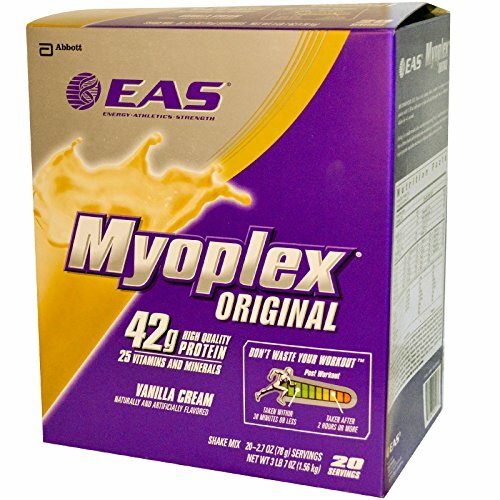 Myoplex Lite is also a good source of fiber, and contains no hydrogenated oils. 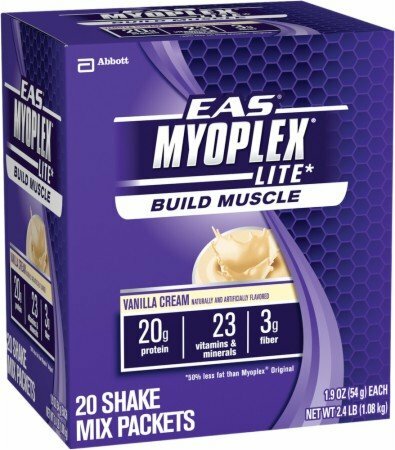 Take the guesswork out of optimal nutrition, and use Myoplex Lite to build your best body ever! Disclaimer These statements have not been evaluated by the FDA. These products are not intended to diagnose, treat, cure, or prevent any disease. Looking for more Eas 20 Packet similar ideas? Try to explore these searches: Tangent 4 Bolt, Carhartt Face Mask, and Shadowline Lace Robe. Look at latest related video about Eas 20 Packet. Shopwizion.com is the smartest way for online shopping: compare prices of leading online shops for best deals around the web. Don't miss TOP Eas 20 Packet deals, updated daily.